Online learning is changing how we teach, but how can we determine whether this approach is effective and enhances students’ learning? While many have made claims about the effectiveness of blended learning, which combines both in-person and online instruction, few have had the opportunity to definitively test whether or not blended courses result in better learning outcomes. In Fall 2014, Economics faculty tested this question with two sections of the Introduction to Probability and Statistics course (ECON 103). Each class included two lab sections, in which students learned Excel skills and put statistical concepts into practice. For one class, both lab sections were taught in person (the control group), while the lab sections of the other class learned the lab material through online modules (the test group). Teaching the same material with both a control group and a test group allowed a quantitative comparison of learning outcomes at the end of the semester. To develop the online learning materials, two faculty met regularly over the summer to write the ‘scripts’ for the online Excel labs and then record screen captures using SnagIt with support from an LTS staff member. 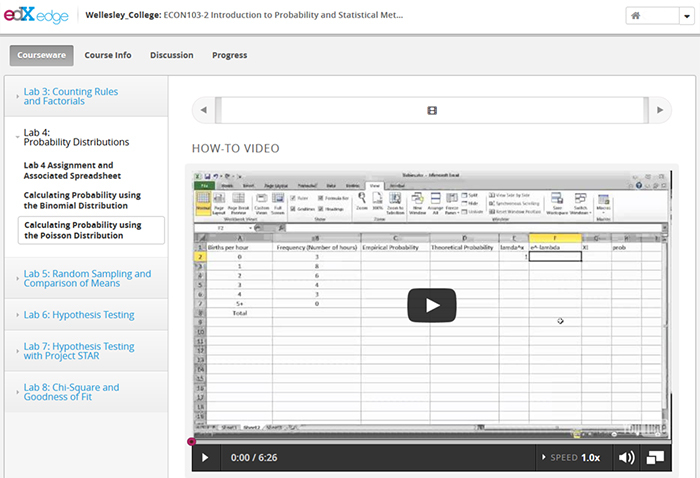 Once the recordings were edited, the lab materials were posted on an EdX Edge course site. At the end of the semester, information about students’ performance in the course as well as relevant covariates, such as previous Excel knowledge, GPA, and class year, were gathered into a dataset. The results indicate that students performed similarly in both the in-person and online labs. Interestingly, students in both the in-person and online labs were satisfied with their experiences and would not want to switch to the other method. While some self-selection into the labs may have contributed to this, we suspect that it may be more attributable to a 'like what you know' phenomenon. Given the success of the intial project, it has been expanded. Economics students are creating instructional videos for Excel 2016 and the Mac version of Excel, as well as video tutorials explaining solutions to problems sets for several courses.